For Vincent van Gogh (1853-1890) his work was his life’s purpose, and through his art he explored themes that meant a lot to him. He saw the work of artists of the past as something to be learnt from, to absorb their lessons and apply them to his own time. Jean-François Millet (1814-75) was someone that van Gogh felt a particular affinity with, in particular the way he portrayed rural labourers. 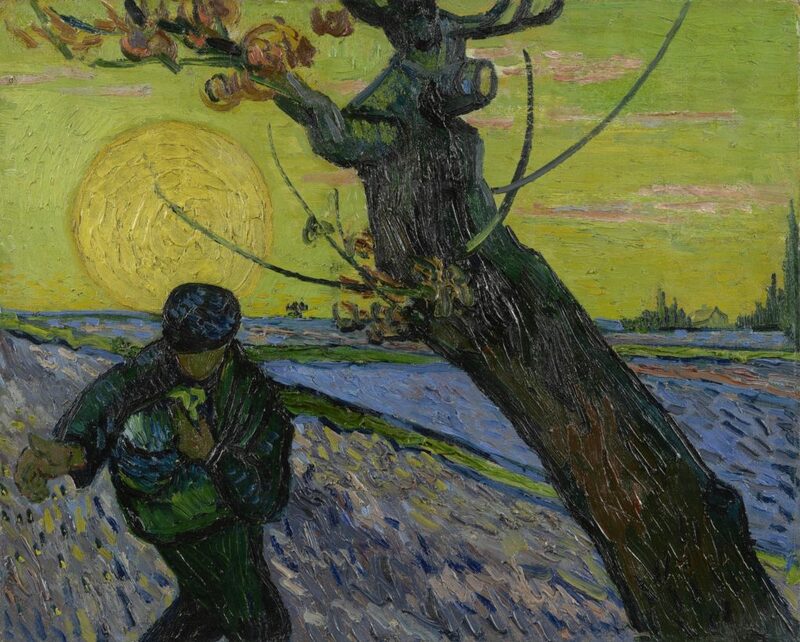 To Millet and van Gogh, the ordinary peasant was heroic, a symbol of moral (and often religious) virtue. Millet himself was the son of a farmer, and so he painted what was close to his heart. Van Gogh poetically said of him that he “is the voice of wheat.” The work of the agricultural labourer is dictated by nature and the seasons, cyclical like life. Their work is hard and honest, ritualistic and full of humanity. There is a sense of knowing, a history of what those who have gone before have done and getting out of the land what they put into it. Van Gogh so often paints this kind of truth and soul, concealing nothing and striving for a higher, almost transcendental goal with his art. This ethic of ‘reaping what you sow’ was significant to van Gogh, who produced over thirty works on the theme of the sower, finding parallels with the noble labourer as a painter; “One must undertake with confidence, with a certain assurance that one is doing a reasonable thing, like the farmer who drives his plow… (one who) drags the harrow behind himself. If one hasn’t a horse, one is one’s own horse.” This version of The Sower, was painted in 1888, the year he moved from Paris to Arles with the hope of starting a kind of artistic colony and recovering his ill health. His sower is literally faceless, and being anonymous gives him a sense of timelessness while denying any feelings of nostalgia. Van Gogh’s translation of a traditional theme is a thoroughly modern one. The composition is strikingly simplistic. The sower comes into view from the left-hand side, head down, scattering seeds with his large brown hand. Wheat was symbolic of the soul and eternity, and so the sowing of it could be read as a religious activity. The thickly impastoed setting sun (life-giver and creator) behind the man’s head creates a halo resembling those flat discs used by artists from the Byzantine through to the Early Renaissance, adding further to the spirituality of the scene. The sky itself could be a gold leaf background, as seen in mosaics and altarpieces. In the way that Vincent van Gogh returned to the subject of the labourer, like the routine of the sower himself, reaping what he sowed. His brother Theo thought his reworkings of the theme after Millet were his best work.